When you are feeling lonely or anxious, it’s easy to get caught up in the jumble of emotions. What you really want is a trusted friend to listen to – someone who can help you to see the situation rationally and who can offer perspective. Unfortunately, for too many of us, this trusted friend is no-where to be found. Maybe your family has moved to different parts of the world. Or, perhaps you have recently left your career, after decades in the workforce. Whatever the reason, if a close friend is not available to help, you may need to find ways to help yourself. One technique that I have found helpful in the past is to reconnect with my inner-child. Now, before you think that I’m getting all “new-age-y” here, I want to be clear that I’m talking about a psychological technique that actually works. The trick is to take a step back from your emotions and give yourself advice in a balanced and rational way. Image that you were talking to a younger version of yourself. How would your younger self describe the challenges that you are facing? How would you respond? What advice or comforting words would you offer to your younger self? When we take a step back from our lives, we are often able to see the greater context. So, why not give it a shot? 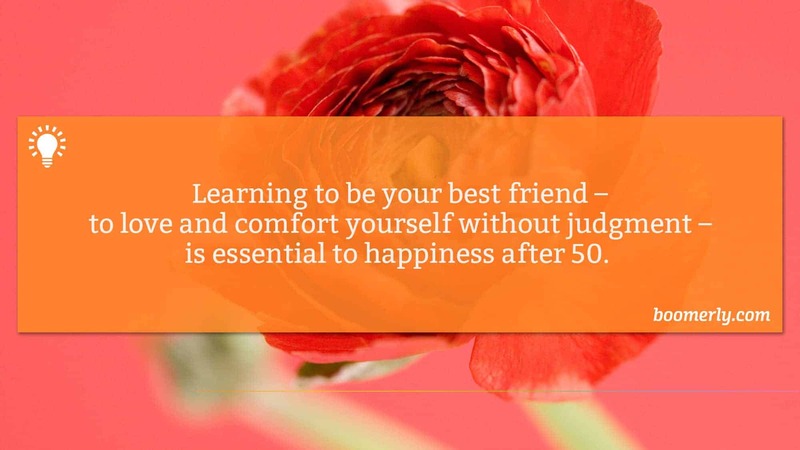 Why not learn to comfort your inner child so that you can get on the path to finding happiness after 50? Have you tried a technique like this before? Did it help you to deal with a specific challenge that you were facing in your life? Why or why not? What else have you done to find happiness recently? Please join the conversation below. Here’s a short video that I recorded to help you find happiness after 60.